Can You Smell a Bedbug Infestation? What is that smell? You get a whiff of what smells like wet moldy towels left fermenting in the bathroom. It isn’t pleasant and inquiring minds want to know what, why, and where it’s coming from. You may need the help of a NJ pest control company to help you ferret out the cause. If you’ve determined you don’t have a water leak that causes mold, the next thing to consider is a bed bug infestation. These bloodsuckers are already unwanted visitors to the home with their penchant for dining on humans and pets while you’re getting what should be a good night’s rest. Bed bugs have a distinctive odor that can’t be missed. It’s been described as smelling “musty”, “moldy”, and like “spoiled fruit”, “almonds”, or “coriander.” Regardless of the odoriferous descriptions, you don’t want them smelling up your house. The most common thought of where the smell originates from is from the droppings the bugs leave behind. While a handful of bed bugs most likely won’t create a distinctive odor, a large infestation most certainly will. If you step on a bed bug, that also creates a strong smell. To eliminate odors, have your home inspected by a NJ pest control professional. 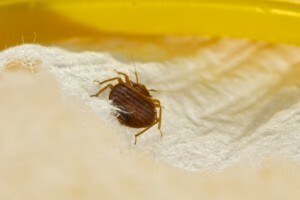 For help and information on bed bug extermination, contact Stern Environmental. We have the latest technology to remove these pests from your home.